4d. [Question asked while tapping a microphone], “IS THIS THING ON?” with the repeated THI in the swirl zone. 6d. [Experiences fame], HAS THE LIMELIGHT. The ELI appears twice. 13d. [Drink for Hercule Poirot], CREME DE MENTHE. 14d. [Spreading belief? ], MANIFEST DESTINY. Spreading geographically in an imperialist colonization fashion. 66d. [Plus or minus thing], BATTERY TERMINAL. 84d. [[This is how it might have happened]], DRAMATIZATION. 69d. [Crawling, say], ON HANDS AND KNEES. 88d. [Texas], LONE STAR STATE. After I finished the puzzle, I checked the NYT’s online rendering of the puzzle. What?? They put the clockwise and counterclockwise arrows in the grid to make things way more obvious? I appreciated the extra challenge of having to figure out what the gimmick was. The printed Sunday Magazine also includes the helper arrows. Pass! I could imagine some solvers have forgotten 1a DEBI Thomas and don’t know about Vietnamese 3d BANH MI sandwiches, thus finding that a tough crossing (the DEBI spelling is a bit unusual). Thomas was the first black athlete to medal at the Winter Olympics (see 22a WINTER SPORT), and went on to finish her premed studies at Stanford and become an orthopedist. And if you don’t know Asian cuisine, well, that is too bad. Favorite fill: THE MIKADO, PETARD (a [Castle-breaching explosive] as well as part of “hoist by your own petard”), NEON DEION (ever notice that his name’s at the start of deionization? ), MALFEASANCE, POLAR BEAR, BANH MI, ETYMOLOGY, MPEG FILE, HOLODECK, and ASIAN FLU. Lots of colorful vocab here. 94d. [Tasting like lamb], MUTTONY. Eww. 126a. [Benzene derivative, for one], ARYL. Dang! That’s markedly more obscure to non-chemists than ENOL. 105d. [GPS, e.g. ], SATNAV. Short for satellite navigation. Isn’t it bonkers that your car can send a signal up to a satellite that figures out the car’s location and conveys that location to the navigation system? 7d. [State capital in a mailing address], ST. PAUL, MN. Hey! ERIE is in the grid, but not as ERIE PA, and for that, we are grateful. Despite the intricate theme and a goodly amount of interesting fill, there’s little in the way of unfortunate fill—and I know that is not easy to pull off. 4.5 stars for Jeff’s latest. Matt here, filling in for Andy. 39-A [Convenient snack?] = NOSH IN ONE’S BELT. This entry was my downfall, as I had ON instead of IN there. “Notch in my belt” outGoogles “notch in my belt” about 4 to 3, though, so that’s ON ME (41-D). 99-A [Money for fast-food fries?] = SHOESTRING CASH. Shoestring catch. 115-A [Outback outlaw?] = BUSH CASSIDY. Butch Cassidy. 118-A [Self-cleaning laundry?] = SMART WASH. Smart watch. I know Apple wants to start this craze, but I’ve never seen someone wearing a “smart watch” in the wild, nor even heard someone speak the phrase. 33-D [Avoid diner dishes?] = ESCAPE HASH. Escape hatch. 53-D [Spell?] = WICKED WISH. Wicked witch. That’s a reasonably good theme, though not too sparkly. DIONYSUS, SCHMALTZ, HOOKAH, ONE-LINERS, YAZOO, side-by-side NEVADA and OREGON, RISK IT, SPEEDWAY, NOT SURE, WHAT THE…?, LA-LA-LAND, and MOON SHOT. I think the southwest corner is going to be a problem for many solvers: SKI BIB was new to me, HECUBA and OLESON are tough proper names, and all three cross KEL, another tough proper name. And then BANGS is toughly clued as [Beatles trademark]. Film titles + food (as) puns. 23a. [Sauce for prison cuisine?] THE SHAWSHANK REDUCTION ( …Redemption). 40a. [Cheese in many flavors?] 50 SHADES OF GRUYERE (… Grey). 66a. [Adventurous salad chef?] LAWRENCE OF ARUGULA (… Arabia). 90a. [Guy with a complete spice rack?] A MAN FOR ALL SEASONINGS (… Seasons). 114a. [Where nostalgia for asparagus might take you?] HOME FOR THE HOLLANDAISE (… Holidays). Only five entries, but they’re all quite lengthy. The wordplay consistently affects only the last element of each. 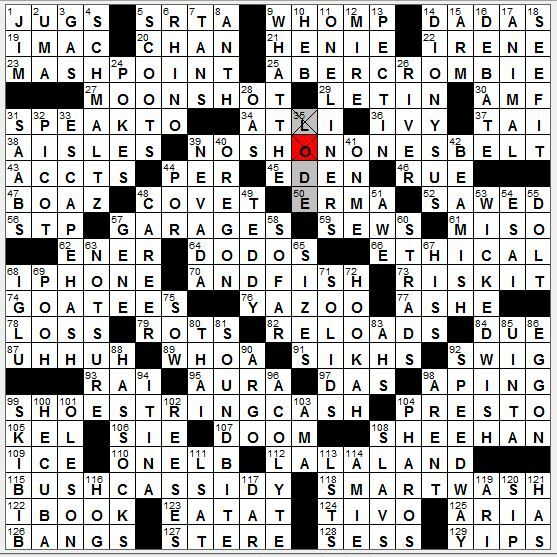 Of the group, only 90-across’ seasons/seasonings strikes me as weak sauce, due to the etymological affinities that are ‘baked in‘. Also on the menu: 49a [Option on tap] ALE, 88a [Sushi fish] EEL, 10d [Chutney fruits] MANGOES, 34d [Reuben bread] RYE, 65d [Menu words] À LA, 68d [Espresso foam] CREMA, 89d [Edible tubes] ZITI, 112d [Blackthorn fruit] SLOE. Tangential: 11a SABLE (not Martes zibellina, as clued, but Anoplopoma fimbria), 71a [Sharpens] WHETS, 113a [Broke a fast] ATE, 3d [Italian for “country”] PAESE, 75d [Piquancy] TANG, 103d [1980 Dom DeLuise picture] FATSO, 117d [“Bad” cholesterol] LDL. 27a [“Rosy-fingered deity”] EOS, 11d [Goddess of discord] ERIS, 72d [Mother of Ares] HERA. 56d [Bounding main] OCEAN, 107d [On the 56 Down] AT SEA, 74a [race on waves] REGATTA, 30a [Key] ISLE, 105a [Fleet runner?] ADMIRAL. 77a [Magical spell] HEX. Oh, hello. Lesser-known vocabulary: 11d [Icy pinnacle] SERAC, French sérac, literally, a kind of white cheese, from Medieval Latin seracium whey, from Latin serum whey. 43d [Medieval guild] HANSE, namesake of the Hanseatic League. Long downs, spanning the two centermost themers: FINAL EXAM, RADIATION. Elsewhere are LOUDMOUTH and LIFE STORY. 62a [Non-payer, it’s said] CRIME. Huh? Solid construction, solid cluing, nothing too exciting. Average Sunday fare. This entry was posted in Daily Puzzles and tagged Emily Cox, Henry Rathvon, Jeff Chen, Joseph Groat. Bookmark the permalink. Yep, there’s no good clue for ARYL. It might as well be [Chemistry thing you get from crossings]. Even for the moderately chemically aware, there are no good clues. You can’t use the word “aromatic” (because that’s the AR) and you can’t give examples (because, like, phenyl, they all share the YL). I enjoy your reviews, thanks. I do want to encourage you to read up a bit about GPS. Your car does not send signals to the satellites. It’s still pretty amazing. But the satellites do all the talking and the car just listens. The satellites all transmit the time and their location at exactly the same time, and the receiver works out the distance to each satellite based on the lag between transmission time and time of receipt. As long as the receiver can hear three satellites, it’s simple math to determine its location based on position and distance of the three. Hearing four gives you your altitude as well. Simple but bonkers. Just to correct a common misconception. All the SatNav unit does is receive the satellite signals, it can then use the strengths (and possibly directions) that the signals it receives, to triangulate and pinpoint your possition with simple latitude and longtitude coordinates. However most car SatNav systems, have sufficient memory in them for say the entire road map of North America. Whether or not it broadcasts your location to a security company or something else, has nothing directly to do with the actual navigation system. Things like that may have to do with certain built-in safety systems. But in a nutshell all a satellite navigation system is doing is acting as a receiver and definitely not a broadcaster, at least not to the satellites. What it does with your location info is a completely different issue. Also many navigation systems also make use of cell phone towers to help with the triangulation. however the tracking of cell phone locations as they go switching from tower to tower is a completely different issue too, as and for your satellite navigation purposes is not strictly needed. You can actually buy a very cheap GPS system that just gives you your latitude and longtitude figures to coordinate with no map, and no broadcasting… All it’s doing is receiving. I just saw the other posts, they weren’t there when I first started composing my own mini diatribe! just to reassure you that there is no coordination going on between us posters! The attack of the Martins. Gotta be Amy’s worst nightmare. The avatar is keyed to your email. If you get that wrong the system substitutes a default avatar. The answer IS CREME DE MENTHE! There’s that D and E on the right and top of the circle. You are absolutely right! Brainfart. Post fixed. I totally knew I’d flush out the pedants with my SATNAV remarks. Kind of a fun game. Amy – how are the cars supposed to navigate the satellites if they don’t send signals to them? While I won’t disagree with the fact that I and others can be pedantic at times. I have to say that when somebody starts off a remark by saying “Isn’t it bonkers that … ” and has it backwards, I don’t think it’s pedantic to point out that you are incorrect. It’s not bonkers, because it’s not true. Unfortunately it is a very common misconception, and an easy one to make. I mean, someone had to tell me. I suppose the pedantic part is explaining the basic principle of the system in 10 words or less! I know at times, and probably at all times, it’s a thankless task writing a daily detailed blog, and most of the time getting criticism as feedback. But it seems to me that if a critic points out inaccurate or poor clues as is frequently the case (and usually well deserved), then when any critic makes a factual error, and has a comments section then they can expect to get corrected. In my case, I can assure you that the last thing on my mind was “Aha! Amy’s wrong… time to get even!”. It was simply wanting to correct a common misconception. After all, correcting an erronious statement that is factually backwards is hardly pedantic. Although, some of the overlong explanations (including mine) probably feel more like mini-lectures than comments! For that I apologize. Let me say this though, a lot of the time I agree with you. But, please don’t get the impression that there’s a hoard of anti-Amy pedants just waiting to spring… we aren’t quite that organized yet. I’m sure she meant savants, not pedants! Nobody needs to apologize… It’s just the wee hours. Cool observation, that SATNAV and savant are anagrams. 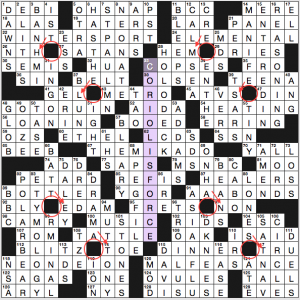 So, ahem, now that that’s over, just need to say how frustrating it is that the NYT app can’t accommodate some of these more creative Sunday puzzle renditions. It’s 2016. It’s arrows. Figure it out. True. The computer world has gone ‘way beyond ASCII– the 1970s were a long time ago. Nowadays, a puzzle solution and a puzzle solver should be able to specify any color and any Unicode character in or around any square. I’m just going to go on believing that SATNAV is an elaborate whisper campaign fostered by Big Troma. I accidentally clicked on 3 * for the NYT, but intended 4. I thought it was brilliant, but tedious. Of course, some people say the same thing about Bach cantatas, so go figure. FYI: they’re called SatNav in Canada too (and probaly the rest of the English-speaking world). What do you guys Stateside call them, aside from GPS? “SatNav” is a generic term. “GPS” is the system deployed and maintained by the US. Canadians probably avoid saying GPS because they’re jealous. The Russians have GLONASS, which is actually pretty good. Most commercial GPS receivers today use both GPS and GLONASS satellites to increase coverage. Russian military positioning receivers use both GPS and GLONASS satellites as well. But proud Americans usually just say “GPS.” I think we also say “Navi,” the German term, probably because auto navigation systems were first widely available on upscale German cars. GALILEO is the European SatNav system. China has BeiDou. In Canada both terms are used, but SatNav is usually used in reference to car systems (for some reason). For example, people refer to the system on/in their phones as just GPS. Printing the LAT puzzle does not work today with the new interface. I get the printer screen but nothing prints. Anyone else having the same problem? 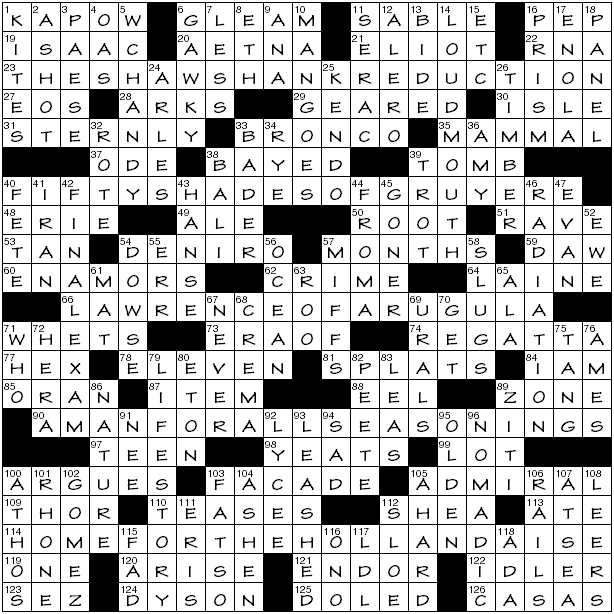 NYT: Very creative puzzle. And having done without the hint of arrows made it a lovely challenge, as I entertained several hypotheses along the way. Getting the CORIOLIS FORCE was very helpful! And many lovely entries along the way. Beautiful Sunday! Three Apple related clues in a one puzzle? What is the LA Times thinking on this one? Can’t find a way to get rid of two and leave just one? Very nice theme. At first, the turn threatened to leave some squares underchecked, and then it turned out amazingly to overcheck some! Impressive. Fairly difficult fill with such things new to me as OH SNAP and SATNAV. (However it works is fine with me.) Could have lived without the crossing of a sports figure and an alternative spelling of what both RHUD and MW11C have as Lao-Tzu. I got that square wrong. As usual most of the other proper names like DAVI, DEBI, and TEENA were obscure to me, but easy enough to get right from crossings. I really liked the NYT and I’m *very* glad I didn’t do it on paper. The arrows would have annoyed me. (CRooked). That explains it, but proves that it’s awful. Okay, even this late I am the first to note that the NYT made my head spin. I printed the puzzle from AcrossLite, so no pesky arrows to make things too easy. Not to be pedantic, but when I look up Coriolis force, the Northern hemisphere is illustrated with clock-wise movement, and the Southern with counter-clockwise arrows. This is the opposite of the puzzle. I looked it up because I had only the most passing of knowledge about it. The substitution in the LAT was tch for sh, not ch. I agree w/Matt that the entire SW was a bish. LAT has MANY questionable defs: Beatles hairdos not really BANGS especially for 80% of their careers, Longfellow bell town misspelled, … on and on. And what’s the connection between HASH and dishes, pray tell? Umm, Bob, I find ATRI when I google the bell town. The HASH is implied by the word DINER, and I guess doing the dishes is the worst job in a hash-house. I got BANGS before anything else in the SW, BTW – must be an age thing.